Byron Burger is a chain restaurant that I've never actually tried! They were founded in London in 2007, the same year that I arrived in London myself, and somehow managed to slip under my radar whilst I lived in the capital. 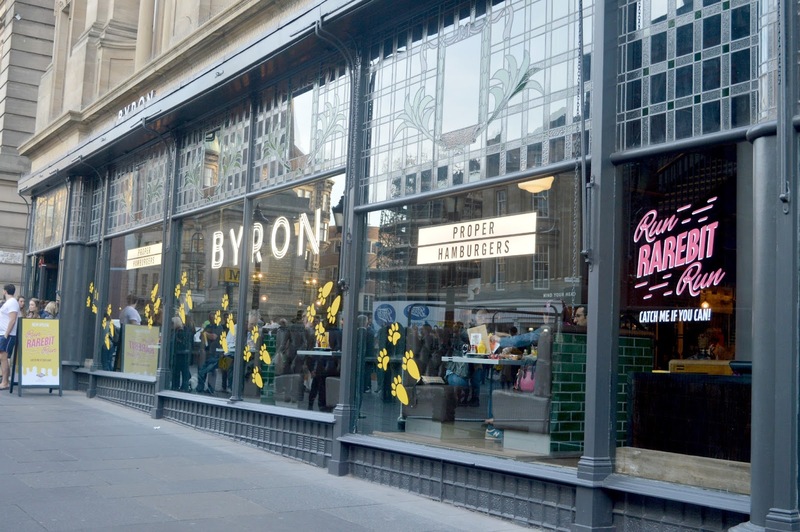 So I was pretty chuffed when I realised that Byron would be opening a restaurant on Grey Street in Newcastle. Announcing that their mission is to "bring proper hamburgers to the Toon", that's a statement I decided I could definitely get on board with so I happily accepted an invitation to check out the new place on launch night. 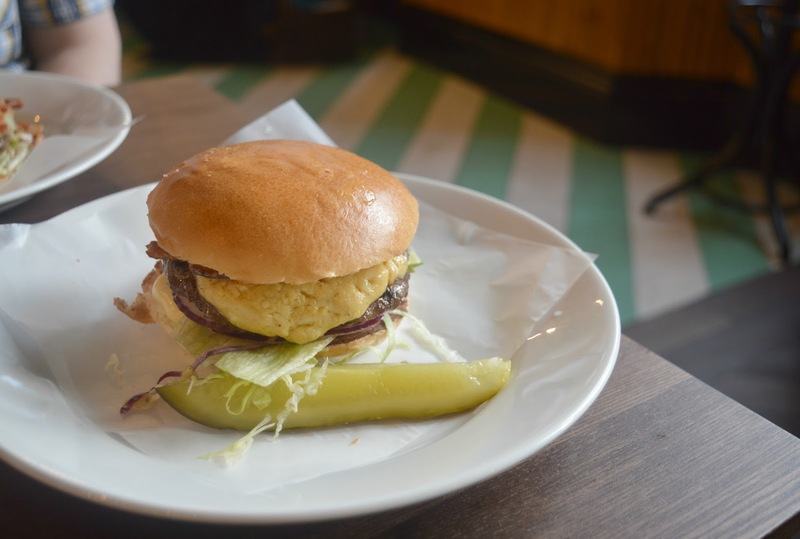 Byron prides itself on serving burgers the way that they should be. That means freshly ground British beef, cooked medium and served in a soft bun. The menu is short and consists of simplistic burgers created with minimum fuss - Classic, Cheese, Chilli, Smoky and the Signature Byron with a regularly rotating list of Specials for those wanting something a little more adventurous. All of Byron's restaurants have their own unique design and in Newcastle the designers had something fantastic to work with. Housed in the old H&M store, the building is Grade II listed and absolutely stunning. Using the buildings historical features the team at Byron have incorporated beautiful stained glass and a dramatic central staircase to complete the look. The Newcastle restaurant is the only one in the UK to feature a full length bar where customers can enjoy draft beer, cocktails and hard shakes. 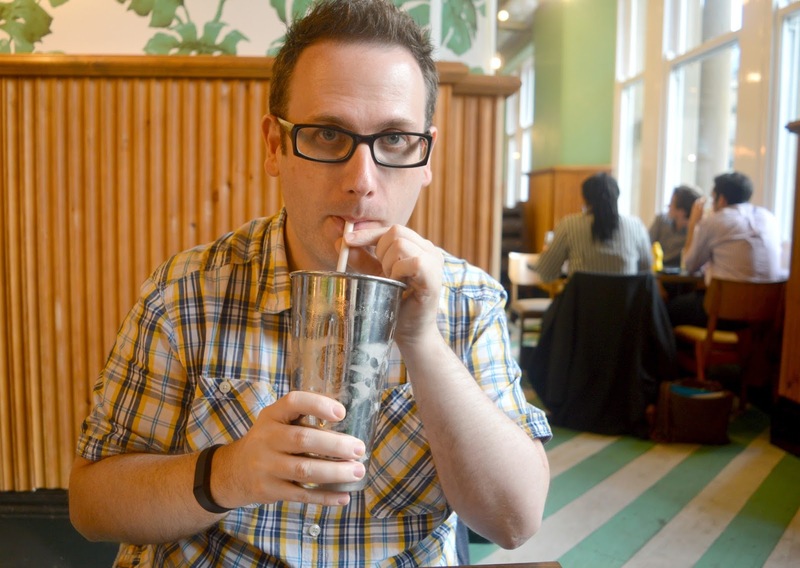 Despite that I ordered a diet coke but Simon was a little more indulgent and had an Oreo Cookie milkshake. We're currently both obsessed with Oreos! This one arrived in a huge tin mug that made my Mr grin from ear to ear. A very generous size that kept him going for the whole meal (and beyond!). The shake was creamy and thick, so much so he almost convinced himself that all that hard work slurping up his milkshake might make up for him missing his session at the gym. Of course, the real reason for us being at Byron was to try out the burgers, a job that we took very seriously when studying the menus. 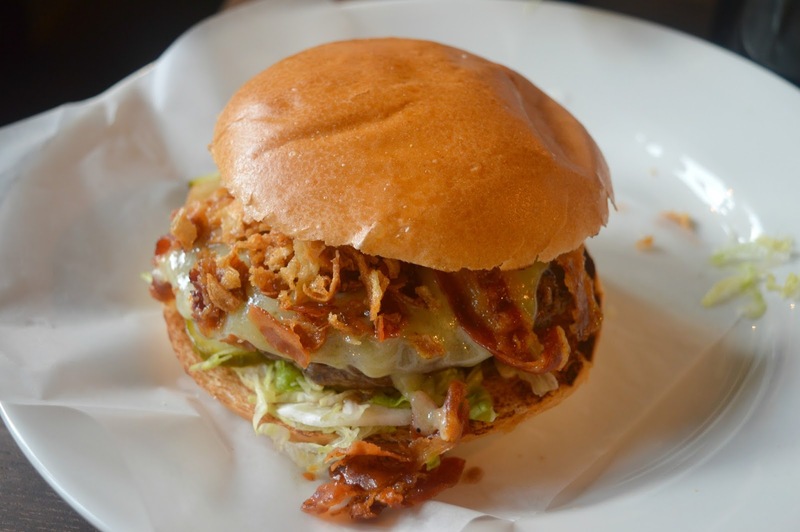 Simon opted for "Le Smokey", a hamburger served with mature Cheddar, streaky bacon and crispy fried onions (which I was very jealous of) and then smothered in a sweet and tangy chilli BBQ sauce. I decided to order the latest special, "Run Rarebit Run", a hamburger topped with vintage Cheddar rarebit, dry cure bacon and smothered in a beautiful mustard mayonnaise. 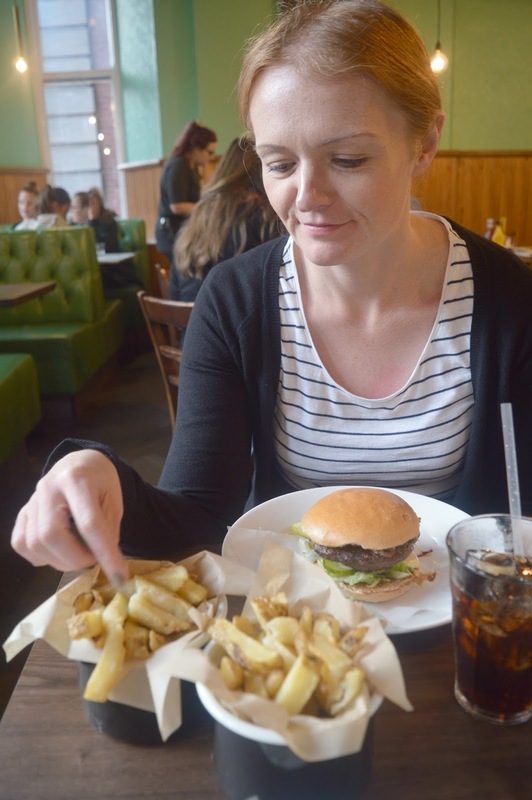 Does anyone else always struggle to eat burgers in restaurants? Simon has it down to a fine art. He masterfully cuts his burger into two and then eats it without dropping any. Whenever I attempt to copy him I end up with very messy hands and then I lose half my filling. The burgers were delicious and we both loved that they were cooked medium. The inside was perfectly pink and juicy. 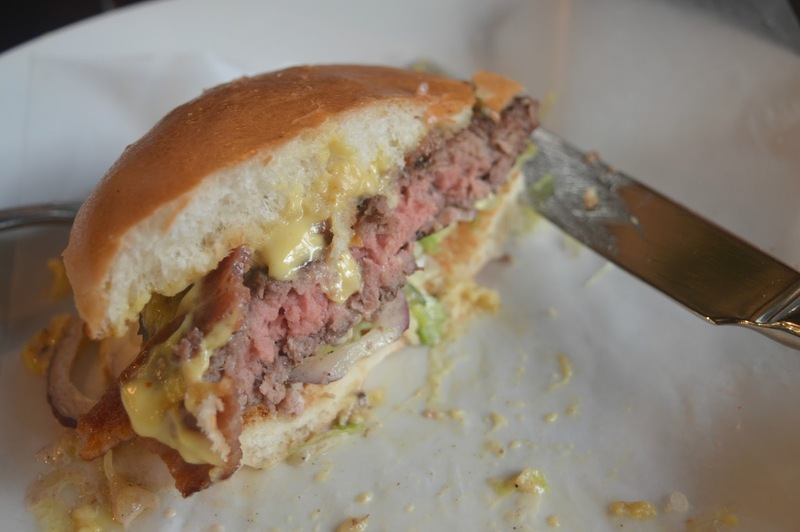 I know the inside of a half munched burger isn't the prettiest picture, but just look at how delicious that burger looks! 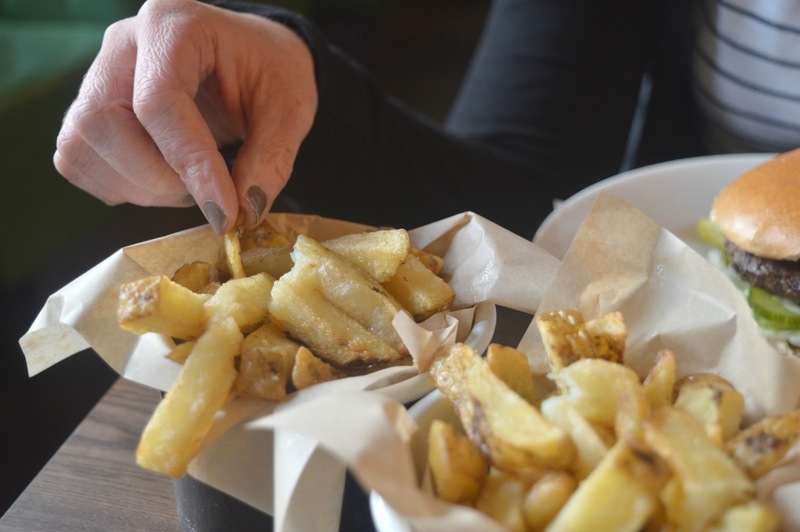 As a side we ordered the Homemade Skin-On Chips which were chunky and so good smothered in mayonnaise. I was quite curious to try the Courgette Fries, but I'm guessing that every time we visit Skin-On Chips will probably be too tempting for me. As we mopped up the last bits off our plate, Simon soon realised why I'd decided against having a milkshake. I was saving myself for dessert! 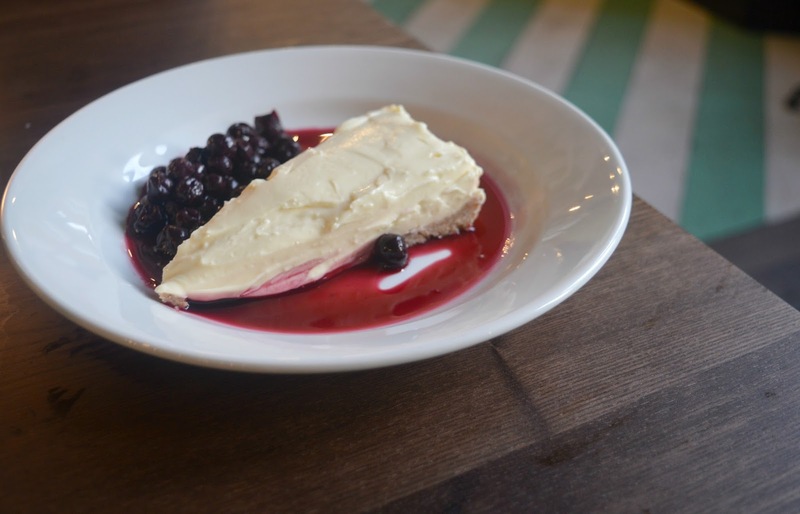 So whilst he sat and watched me, I indulged in the most delicious White Chocolate Cheesecake served with honey-poached blueberries. Byron you have a big fat thumbs up from us! Welcome to the Toon! Mmm, I could just eat that Smokey burger (don't care that it's 7.18am!) I tried Byron Burger for the first time last week too (blog post coming soon) and I was equally impressed, love the building too! Looks amazing!! I'm not a huge burger fan but definitely want to go here. I make courgette fries at home, they're yummy but not as filling as proper chips! Delicious post!!! It is so good. AND tomorrow (06/10/2015) they are doing burgers for 25p if you're a Burger club member (free to sign up) to kick start their work with a charity helping to provide school meals for kids. Oh it does look really good! Ahhhh your review may have swayed me to give it a go! Loving the size of the milkshake! !